And there is much more authors have said about the experience, but I realized there was one other group of people whose opinion of these interviews are vital—the readers. While this style of interviews solves many problems with the standard author and character interviews and thus making the process all the more enjoyable, what would the readers think? So I asked for volunteers. 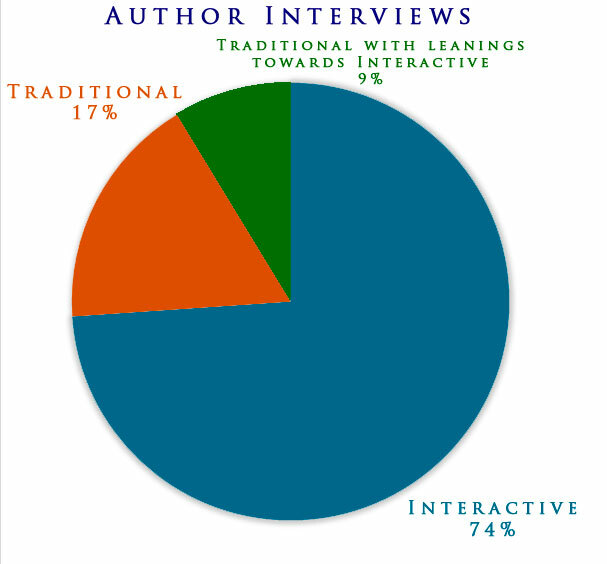 17 people voted the Interactive Interviews for both the author and character interviews. 4 voted Traditional Interview for the author interview, but they chose Interactive Interview for the character interview. Out of 23 people, 21 people voted Interactive Interviews for the character interviews. Only 2 people voted for the Traditional Interviews for both author interview & character interview. So, what is the verdict? Among authors and readers, the Interactive Interviews are largely popular, but there is still a place for the Traditional Interviews. The traditional style interviews are readily available to anyone who wants to conduct interviews. Sample questions are just a Google search away. However, the Interactive approach is much more involved and time-consuming to conduct because each experience is tailored to each author, but it is an option for those who just want to have a more fun interviewing experience. To read some Interactive Interviews, you may find them on my other blog, “Meeting with the Muse“. If you’ve published a book and would like me to interview you using this interactive style of interviews, and if you would like the interviews to be promoted on my site, leave a comment, and I’ll be in touch with you.